Balancing the roles of wife, mother, student, employee, friend, family member and church member has been the most challenging thing I have ever done. The last three years have been far from easy, and yet, have also been the most rewarding in many ways; rewarding because God was ever present in my life. God taught me to trust when I was tempted to feel guilty. To rely on Him for financial help when we didn’t know how we were going to pay our bills. To pray to Him when I felt incompetent with someone’s life in my hands. To find peace in Him when I could not fix my patients. 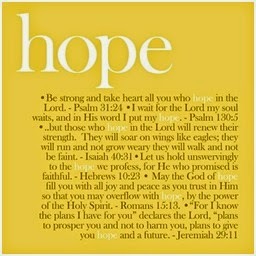 To hope...to hope in Him because of His promises. I have struggled with a lot of doubt these last three years. As I waited to hear back from nursing school admissions I doubted I would get in. Then once I was accepted and in school, I doubted I could pass important exams, doubted I was smart enough to graduate, and doubted if I could even be a nurse. Every time, I was tempted with doubt, God softly reminded me - He is for me. He is the true source of hope. If he is for me, then who could be against me? I questioned if I was being selfish by pursuing my dream instead of staying at home with my young son. I felt guilty that my home, my friends, and even my own family had to come second at times when school became a priority. I fought during the first year of nursing school, trying to convince myself that my family comes first. It did, but I had to admit it was going to look different at this point in my life. 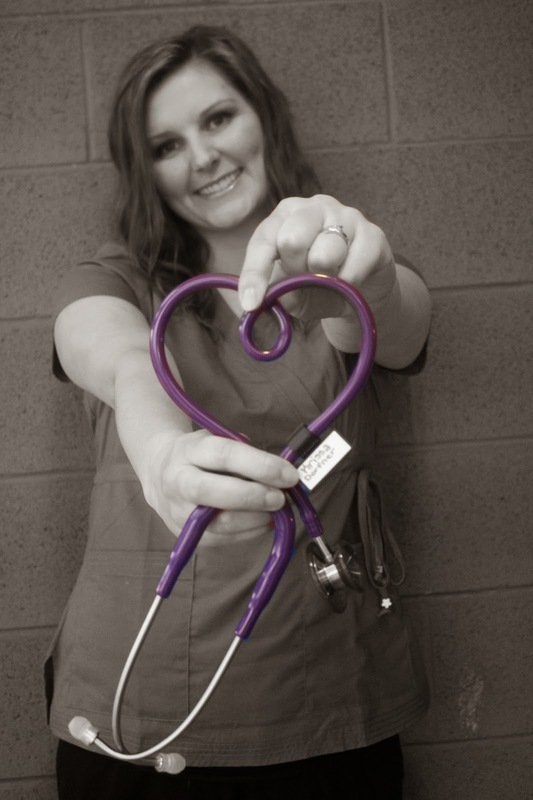 I felt a sense of peace when my husband and I finally accepted that nursing school was high on our list of priorities. This did not mean that I left my family in the dust, it simply brought my husband and I to a mutual understanding that my temporary role of nursing student was demanding time that meant restructuring other roles in my life. I don’t believe God wanted me to feel guilty. I actually believe guilt was being used as a powerful tool to try and prevent me from pursuing God’s good plans for me. While wrestling with doubt and guilt, I discovered a beautiful facet of hope… Security. In Christ-centered hope, I found security and confidence that the Lord my God had brought me to this place in my life for a purpose and a reason. Before nursing school I prayed hard that He would shut this door if it was not part of His plan. When the door opened, I knew God was inviting me in. Again, I found hope as I trusted in His promises. To me, hope is the anticipation that our needs and or desires will be met. Over the course of my three years in school, my hope grew and grew. There were months when we only brought in $1500 to pay for all our bills. My husband and I together would pray and hope that the Lord our God would provide. He did, in amazing ways. My first year of nursing school, I found a $100 Visa gift card in my mailbox. At first I thought it was an accident, as if someone lost a gift card (again, my doubt kicking in). Then I realized that someone put it there with purpose. My second year of nursing school, during Christmas season, My husband and I decided we couldn't do Christmas gifts since we had little money. Christmas is my favorite holiday, so this was not an easy to accept. Then we received a letter in the mail from my aunt. It was a card that overflowed with words of kindness and encouragement. This lovely card contained a check…a check for $500. She insisted that we use it for Christmas to buy each other something nice, and to buy our son a present. Most recently, I had to pass a big nursing exam in order to graduate. I read the email reporting the results that stated “You passed,” and still I doubted. I couldn't help but think that there must have been a mistake, they accidentally gave me someone else’s score! In the midst of hope, doubt creeps in uninvited. However, I made it. I have graduated. I am going to be a nurse. 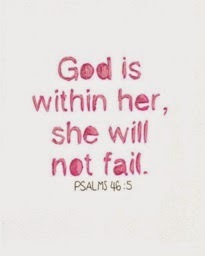 God has revealed Himself and His provision to us over and over again as I have ventured through nursing school. He has shown me my hope does not lie within a clean home, straight A’s, a college degree, an obedient child, a perfect husband or money, but that my hope lies solely in Him. Doubt can poison our minds. Don't let it ruin your faith in Jesus, instead be joyful in hope because we have a faithful God. Open your heart to Him, take that leap of faith, discover where real security lies, and let Him strengthen you with hope. All glory goes to God for bringing me AND my family through nursing school. I am not only alive but still happily married to a wonderful, supportive and loving man, I have a son that still desires to play with his momma, and we have a roof over our head and food on our table. I am truly grateful! It was 12:30 AM Mother's Day 2005, our first as husband and wife, and we were in the ER. I was bleeding; I was pregnant, but they were telling me I wouldn't be for much longer. There was no heartbeat. I stared at the wall, and my husband prayed. It felt like he was juicing my hand as he pled to God. It was not that he was trying to squeeze something out of it, but as if he was trying to infuse life into me. The only nectar found was that of silent tears. They sent me home that morning with instructions for bed rest, information about spontaneous abortion (really medical field, let's give miscarriage a better technical name), and an appointment to see my OB on Monday. My husband prayed, cared for, and supported me as we began our wait. A wait through Mother's Day to get the OB's final diagnosis on what the ER docs were sure about. My beloved was convinced they were wrong, that we would see our baby alive at the ultrasound on Monday. I wasn't so sure. I am naturally an optimistic person. I knew then what I know now; God is a God of miracles. I was also in a heightened state of awareness that my plans didn't always align with His, but I could still trust Him as we waited. I had tasted His goodness, knew it never soured; but I still had questions. Miscarriage, infertility, and motherhood always come with questions. Which path was mine? Would I ever bear a child? Did I do something to make this happen? Would my husband still love me? I had miscarried once before, and I was convinced it was happening again. When I woke later that morning, it was still Mother's Day, and I was still unsure if I would ever hold my baby. Would I experience the horrors I heard other mothers speak of - stretch marks, morning sickness, swollen everything. Suddenly, I really wanted all of those plagues. I was willing to give whatever it took if it meant this little life would live. I asked God many things; some reasonable, some not, and my husband began to bake. When I entered heaven, would I be meeting one or two of my babies for the first time? I knew one got to meet Jesus before I did - would this one too? Were my babies destined to be ones who were in the design of heaven, but never meant to walk the earth? I turned to God for comfort, and my husband added the oil. Would we even see anything on the ultrasound? Last time, by the time I got there... the baby was gone. The womb was empty. My body had flushed my baby's body out, and I had flushed it away not knowing what else to do. I searched and clung to promises in scripture, and my husband cracked the eggs. As I sat mesmerized by the whisking of the eggs, I knew my husband was praying, clinging, and sitting in the peace that passes understanding. We were both resting in silence, waiting. We both knew no matter what, it was well with our souls. But it's never comfortable to have to face it so forcefully. "I am making you a cake for Mother's Day," he said. Sweet, I thought. Which was quickly followed with, I hope he is going to be okay when they tell us the baby has died. I gazed, eyes half-open as he layered the cake. He took great care doing so, and watching him do it was calming. My spirit was heavy and staying awake was difficult. I wanted to sleep. Sleep through the waiting. Then he lifted the cake and transferred it to the beautiful stand that had been a wedding present less than a year before. Suddenly, he excitedly whispered, "Look." He held up the plate he had been carefully crafting my gift on. 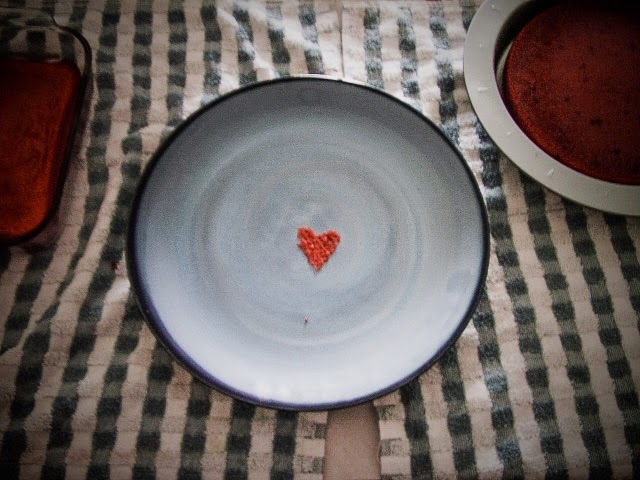 A thin remnant of the cake had stuck to the plate, and formed a perfect little pink heart. I am not one of those fanatics who would make a pilgrimage to South America to see a tortilla with the face of Jesus in it. I don't search for mysterious signs, read tea leaves, or beg God to appear in my cereal bowl. Yet that day, through cake, God dropped a dollop of hope onto a despairing couple. He reminded me He is the one who knits people together. We hoped as we ate the cake, the clock kept ticking, and we waited for Mother's Day to end. We arrived at the obstetrician's office and guided by a Doppler, she couldn't find the heart beat. She said she expected this due to my being only about 8 weeks along. She sent us for an ultrasound, before making the final call, and the technician began. Blue gel, an uncomfortable plastic wand, and then...there was a baby. I could see it, through all the squiggles and static, I saw her for the first time looking like a gummy bear with a flutter within. "And there is the heart beat." The technician's words restored hope, and my shriveled dreams tasted the waters of happy tears. Seven months later around 12:30 Christmas Eve morning, I was again at the hospital, I was bleeding, and I wasn't pregnant anymore. She had arrived. Alive, heart beating, lungs inhaling, and we gave her a name. A name that means "pure heart". I know that Mother's Day can be a hard day for some. It can be a reminder of broken dreams, unfulfilled hopes, even deep shame. It can intensify the loss of a mother or a child, and it can push many memories into the forefront of our mind which we would rather not dwell on. This is a story of hope from my life. One from my most difficult Mother's Day, told only with the intent to encourage - not discourage. Know that God cares deeply about the hurts and desires of your heart. He longs to be the one you look to for comfort and to draw you near. Know that your plea is not unheard, and you are not unseen. He sees you, He hears you, and He is weaving something beautiful together as He becomes the anchor for your soul.